It’s been almost a month, but I couldn’t forget to tell you about Jett’s birthday weekend. Last year we went a little overboard and let the kids pick their own birthday adventure and let’s just say it was a bit expensive. They all had amazing days that they chose, but this year we wanted to get back to simplicity. And back to nature. So, we will (hopefully) be taking a tent camping trip for each of their birthdays this year. For Jett, we picked out 2 awesome nearby campgrounds and let him chose which one he would want to go to. 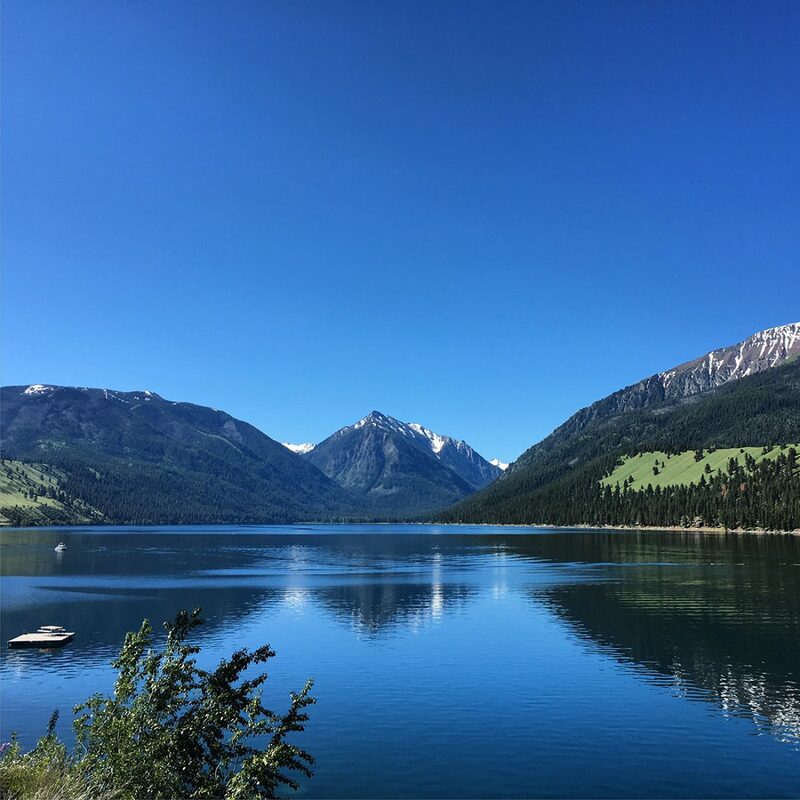 He ended up choosing Wallowa Lake State Park. We booked it online and assumed it would be great weather since the last 2 weeks here in La Grande were absolutely beautiful. Well, we checked the weather and it didn’t look good. How in the world would it go from sunny and 80s to 50s and raining? And that was during the day! We were not going to let the weather ruin a birthday so, we kept on with the plan. That Friday after Jonathan was done working, we packed up and headed out for our 2 nights at Wallowa Lake State Park. Of course it had been raining and cold the whole day so we weren’t able to put any of our gear into the bed of the truck, instead we were all smashed up in the truck with 6 sleeping bags, a big tent, a big backpack of clothes and food supplies, pillows, and other random things needed for our weekend. It was pretty funny to see us packed in there like sardines. The drive up to Wallowa Lake was beautiful. Even in the rain and fog. It was a good 2 hour drive but wouldn’t you know, as soon as we got our tent site information at the office, it stopped raining long enough for us to get our tent up. And as soon as we secured the fly, it started raining. We were all freezing at that point so we jumped back in the truck and headed into Joseph in search of some dinner and hopefully a warm building. Maybe you remember but we have no winter clothes. We each have a pair of pants but all of our jackets are very light weight. I actually had to go to the store a couple days before our trip to get Jett and Ada a pair of pants and some long sleeve shirts for Jett and Jax. We don’t carry winter clothes because we wanted to always follow warm weather - and it had been warm until we planned our camping trip! So, we found this great pizza place and enjoyed their warm building for as long as we could. We wandered around some stores and headed back to the campground. We bought some wood and by the time we were back it had stopped raining so we started up a fire and tried to get a bit warmed up. That night, it was a balmy 35 degrees! I was so worried about the kids and remember waking up often to check and see if they were ok. We were all snug in our own sleeping bags. But man, getting out of them in the frigid morning, I was not a happy camper. Luckily, the kids all had great attitudes and Jonathan got up before the kids to start up another fire. In the morning we had homemade banana bread for breakfast and we even got to talk to the nice couple who was camping behind us. They were on a Harley and pulling this cute little camper/tent thing! It was quite an impressive setup. They told us that we “had” to go to Hell’s Canyon so, with no plans for the day, we took their advice and headed out. It was quite the drive but the views were absolutely worth it. It was so FREEZING up there. We packed a lunch and were able to use our new GKGK Cook Stove. We heated up some soup and had lunch with the most amazing view. We cleaned up, packed up and headed back into town where we caught the tail-end of an antique car show in Joseph. It was pretty neat to watch. We wandered around some more stores in town and headed back to our site. Of course we made another fire because it was so cold! But, at least the fog lifted and sun came out for a bit. We knew that there were mountains around the lake but we weren’t able to see them until the 2nd day here. Just look at what we were missing! What an amazing place. We saw lots of geese and some deer around the campground. It was such a great weekend despite the freezing weather. I hope they will always remember the laughs around the campfire, but I also hope they forget the screaming babies that were camped next to us that night. I felt so bad for those kids. There were two very young kids camping (with their parents of course) in 34 degrees that second night. At one point we heard the 3 year old crying out, "I’m freezing." We saw that the mom was sleeping in their van and then we saw a couple Park Rangers talking with the parents the next morning. Hopefully they stayed warmer the next night. We packed up and drove home and Jett and I were able to make it to our favorite local Ice Cream shop for a little one-on-one time. We finished off his birthday with a family movie night and that young man turned 9! I am so thankful for Jett and they energy he brings to our family. I hope he will always remember his camping trip birthday bash. Check out this video Jonathan put together of our weened celebrating Jett's birthday!